Allocations for the first four vintages (2008-2011) have already taken place and only the 2012 Encore Pinot Noir Vintage's Allocation Remains. This allocation will take place August 2015. With only 300 cases produced, this allocation will sell out quickly. To secure your allocation please click here and if you are interested in library vintages of Sitar, please indicate which vintages in the notes section. In addition, a Collector's Edition 5pk set featuring each vintage of Sitar will be offered to long-standing and loyal Sitar Collectors who have collected every vintage to date including the 2012 Vintage. By requesting to "Secure an Allocation" does not guarantee acquisition of the 5pk Collector's Edition Set as there are only 100 hand signed & numbered sets to be offered. We hope you can understand the rarity of this offering and as such its exclusive availability. 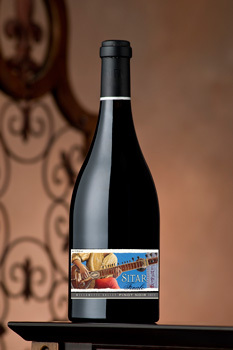 Sitar Pinot Noir is limited to 300 cases per year and allocated in wooden collector’s boxes which display Thomas Arvid’s original charcoal drawing. In order to secure your allocation of the Sitar Prelude as well as future offerings, join our allocation list. © Copyright 2019 Sitar Wines . All rights reserved.